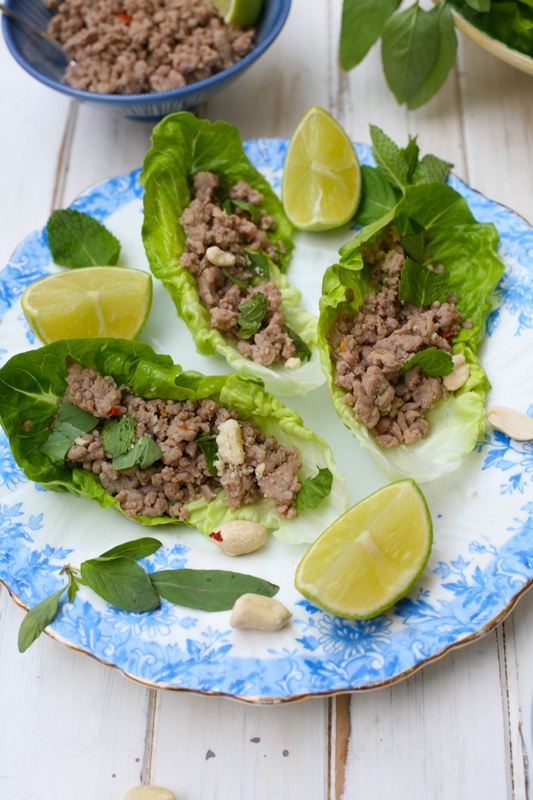 Larb originates from Lao but is also eaten in North Eastern Thailand where many of the Thai people are of Laotian decent. 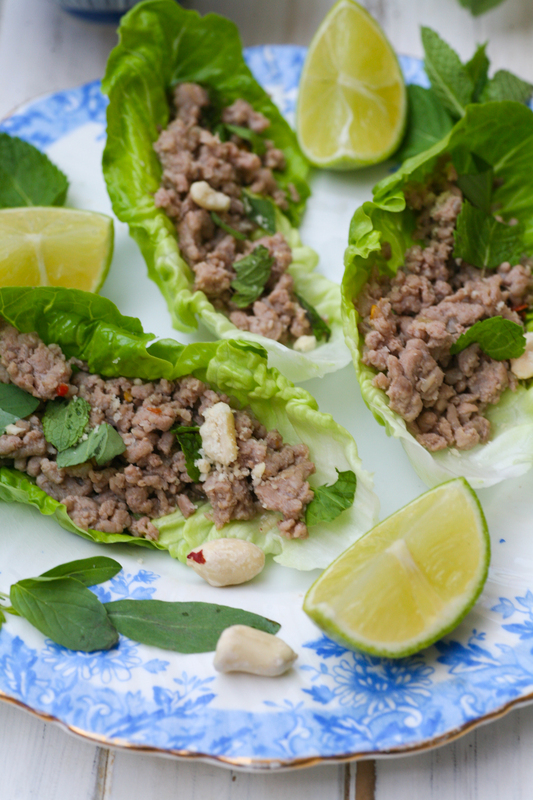 It is, put simply, a meat mince salad (pork, chicken, turkey or duck) that is placed in a lettuce ‘cup’ and then eaten in a couple of delicious bites. They have a similar lettuce wrap recipe in Korea known as ‘Ssambap’ – ssam meaning ‘wrap’ and bap meaning ‘rice’. My version has replaced the rice, (which is traditionally toasted then roughly ground (Khao Khua) and sprinkled on the top of the mince when serving to help soak up any of the juices) with roughly ground shelled and oven roasted unsalted peanuts. I like the crunch and taste of the nut combining with the minced meat and fresh herbs. If you want to stay true to the original recipe then just add ground toasted rice in place of peanuts. Try both and see which works for you. 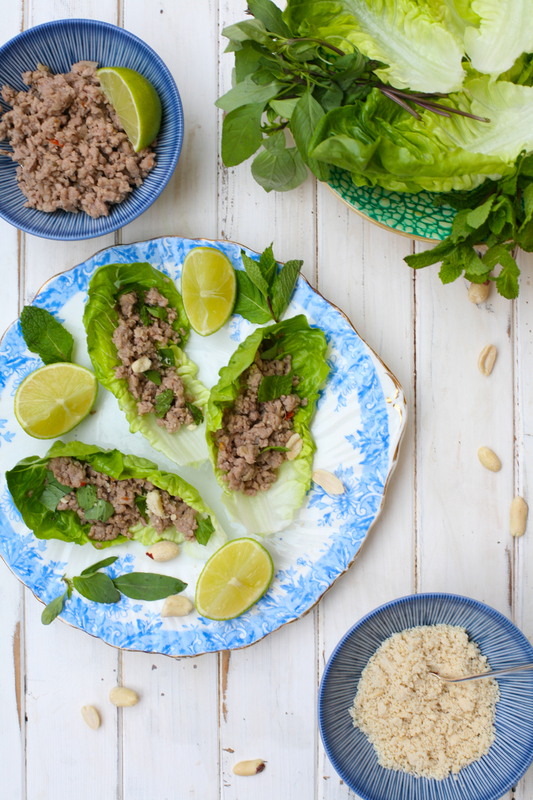 The combination of fresh crunchy salad leaves, fragrantly spiced mince meat and fresh mint and thai basil (or coriander, but I had run out otherwise I would have thrown that in too) is satisfyingly tasty that one, or three in fact, is never quite enough. It is perfect as a canapé, or as a starter whereby guests can put together their own wraps before popping them in their mouths. Personally I love eating with my hands so any excuse to get everyone to throw themselves into this enjoyable pursuit gets the thumbs up in my books. If you tone done on the chilli this dish is also a hit with kids (although my 8 yr old has it as is) as it is a little bit different, packed full of flavours and quite simply good fun to eat, which bottom line is what food and eating should all be about. My dish is more Laotian in style and substance, minus the rice sprinkle. The north east Thailand variety varies again omitting fish sauce and lime juice and instead uses a wide range of spices including cinnamon, star anise, long pepper, cumin, cloves amongst others. I’ll post this version in the future. Throw yourself into it, try something different. I can assure you that you one wrap is never enough. This will become a firm family favourite I can guarantee. 1. In a large pan heat the oil on a medium heat and then add the shallots and fry gently. (Equally 1 large red onion also works well if you cannot get hold of shallots). 2. When the shallots have softened add the garlic, ginger, lemongrass and fresh red chilli and stir together gently. 3. Add the pork mince and move around the pan until all the pink meat has become brown. This will take around 8-10 minutes. 4. Add the fish sauce, light soy sauce, lime juice, caster sugar and red chilli flakes and stir into the mince. Leave to cook on a low heat for a further 5 minutes. Just before serving throw in a few fresh herbs and give a good stir. 5. 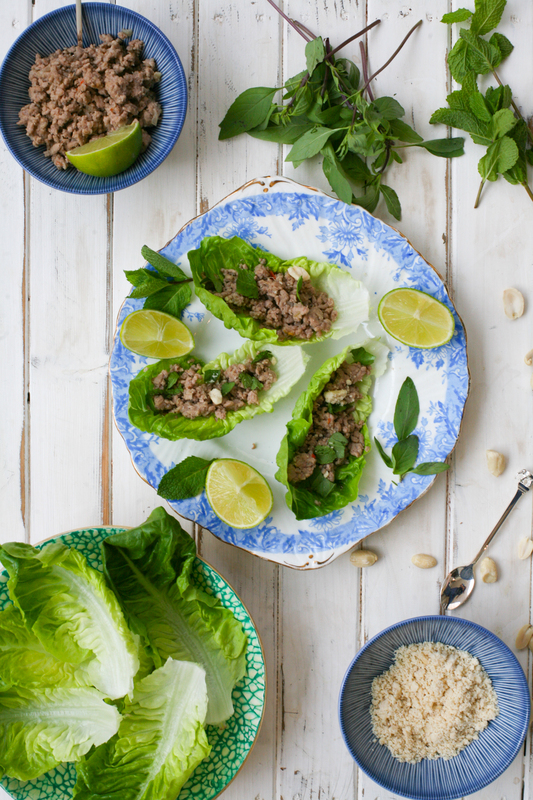 To serve place a tablespoonful of the mince onto the lettuce cup followed by a couple of mint, Thai basil and coriander leaves and a sprinkling of peanuts (or rice if you want to stay totally traditional). Add a splash of lime juice as required. It can be eaten at room temperature or slightly warm. * If your mince has juice, cook it for a little longer with the lid off the pan. That should do the trick. If there continues to be some juice, it is best to strain the mince as it is easier to eat on the lettuce cups if there is no juice. * you can replace the pork mince, with chicken, turkey, duck or I reckon even tofu would work well. This entry was posted in Chicken, Duck, Pork, Tofu and tagged canape, Korea, Lao, Larb, lettuce, snack, starter, thai, Thailand, tofu, wrap. Bookmark the permalink. Hope it get’s the thumbs up. Just finished off a batch for my lunch. Enjoy and thanks for commenting. Thank you SO much Torie, I doubt I will do it justice, but I am going to have a go at this in the next couple of weeks – yours was utterly delicious! And if you do organise a cookery morning in January, I would love to be part of it, as my cooking repertoire is seriously lacking, as to are my skill?! Also, thank you for being a terribly glamorous taxis service last night!! Yann and I really appreciated it and hope you enjoy your 40th party tomorrow and hopefully we will catch up with you trick or treating later today! Wow, this looks fabulous! 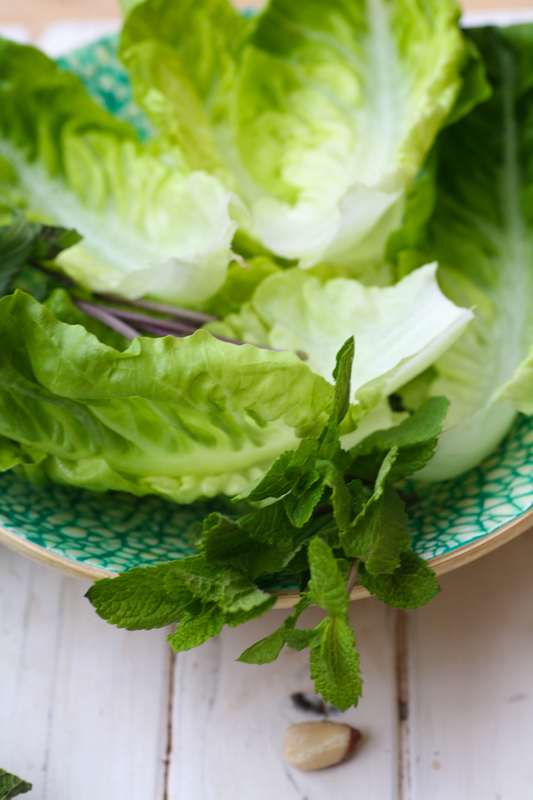 It’s like Chinese lettuce wrap, but it has lemongrass, fish sauce and lime juice that sounds fantastic!! Great job on your food styling! Great recipe. Love to try these. I’ve never seen lemongrass paste, something new to look for! Beautiful post. Thank you. You can make your own lemongrass paste or buy the shop variety – see here http://www.ocado.com/webshop/product/Bart-Lemongrass-Paste/27322011?ULP_CAMPAIGN_ID=3&gclid=CKK04_jn18ECFcKWtAod_G0ATA. Hope you get to try the recipe soon. If you cannot find it or don’t have lemongrass to hand the recipe still tastes great without it so do not worry too much. Thank you for your lovely comment. I hope you get to try the recipe. It’s super quick and easy so perfect for a mid week meal. Sounds good .I will try with Tofu simply because I have it right now.